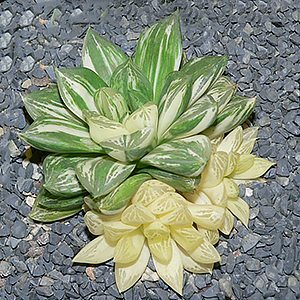 Haworthia, like many succulents are adaptable and will survive under a range of conditions. They are very attractive, have varied foliage from taller upright rosette forming types to rather ‘chunky’ low growing varieties. Some are variegated, others have a translucent quality to them. They are used widely as indoor or ‘houseplants’, and are they are grown for the foliage as well as the flowers. The flowers themselves are small, however interestingly delicate and attractive. 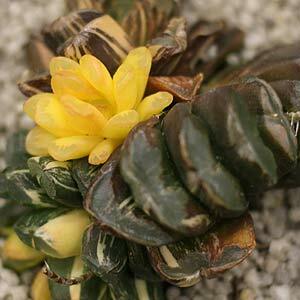 Like many succulents, Haworthia prefer a well lit situation and a well drained soil. Look for species such as Hawthoria fasciata and attenuata, both commonly called the Zebra Plant. Most species are small plants often reaching only 10cm or less in height, grown mainly in containers as specimens they are suited to the rock garden if you have the right climate, which really means a dry arid type. One of the main issues with growing these plants in the ground outdoors is that they are very small and unless you are careful they can easily become overgrown. Cultivation is not difficult as Haworthia grow well in specialist succulent potting mix and prefer a well lit position. The main problems arise from overwatering, and exposure to very hot sun for prolonged periods. With to much sun the foliage will often turn to a yellow colour, if it does simply give them more shade or filtered light. In containers use a free draining succulent potting mix. A top layer of fine pebbles serves the purpose of making the container look more attractive, while also lifting the foliage above the potting mix. When the plants go into dormancy in winter, its time to cut back on the watering to prevent the roots from rotting. Where ever you grow them ensure that the drainage is good, many images of ‘novelty containers’ such as cups, bowls and even shoes are misleading, as they may not have adequate drainage. How often you water these succulents will depend on the season and the growing medium. In winter, watering once every 4 – 6 weeks will be adequate. Lift the pot and feel the weight, if it is light, the plants may need watering, if it is heavy they will not. You can also test the soil with your finger or a soil moisture metre. Always allow the soil to dry between waterings. 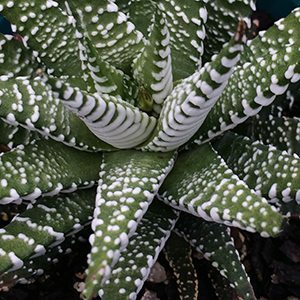 H. fasciata also known as the Zebra plant, mid to deep green foliage with white markings. H. truncata, a low growing variety with yellow flowers. H. koelmaniorum deep rust red foliage. Propagation is from seed or by separating the offsets that these plants readily produce. When dividing offsets use small containers as they seem to respond better to a confined root space. These are not a plant to grow outdoors in areas where they will be subject to cold wet winters and frosts. If you repot every 2-3 years you will need little to no fertilizer at all. Over fertilization is another way to kill these tiny treasures.